Searching for anything in My Old House carries certain risks, usually in the form of an interesting distraction (corsets, small bones I still refuse to discuss, or shoe lasts). My latest search turned up my maternal grandmother’s greeting card album, so I’ve completely forgotten what it was I initially sought! 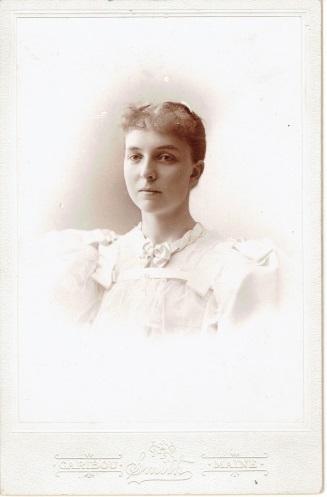 The album is a treasure of illustrated birthday and calling cards from friends and relatives, small “reward of merit” cards presented by her teachers, Valentine’s Day cards, Easter cards, and, of course, Christmas cards. In a digital age of animated, musical e-cards and mountains of ubiquitous boxed cards, Lula’s cards are examples of earlier tastes in design and sentiment. No Santa Claus figures here, no red and green colors, only an occasional holly branch or winter scene, and while the sentiments might have religious overtones, her collection is without religious illustration. More popular at the time were spring-like scenes and spring and summer flowers. One Happy New Year card depicts a young girl holding roses, while the Christmas card below it folds open to reveal its Christmas message: “Love and Light/Illume thy night/Glad Joy and Peace/Grow and increase/And bring each year/True Christmas cheer.” There’s not a generic “Happy Holidays!” in the bunch, and certainly no Grinches. 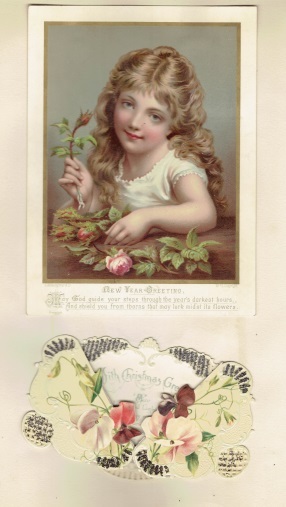 One card’s Christmas wish says: “Now Christmas comes with hearty cheer, May kindly thought go round,/And bring to you a glad New Year with Peace and plenty crowned,” a Christmas wish showing no signs of age. Lovely, Jan! Thanks for sharing these. What a lovely post! And I love the silk-fringed Christmas cards. 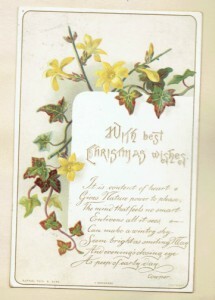 How interesting that so many of the Christmas cards feature spring and summer themes. I too have an album of postcards from 1890 – 1910 saved by my grandmother, including Christmas, Easter, and Valentines Day cards as well as local and vacation scenes. Not only are they beautiful but the writings on the back added new clues for my family history research. One thing I truly enjoy is getting an insight into the way my ancestors thought about things- and it is often not what we assume! These Christmas cards are a lovely, entrancing example. They saw the holidays, it appears, much the way most of us do: a sign that spring would come, a celebration of what it would bring, and enjoyment of family and friends. 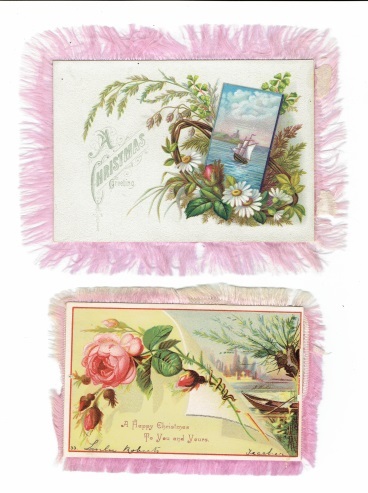 Given the physical circumstances of many of not most of my forebears, I doubt any of them sent silk-fringed cards. But many of them did cut up old cards to make new ones, with all the caring and optimism expressed by these more opulent versions. I simply wanted to say what a lovely note for Christmas eve. I have great grandmothers and aunts from Maine and can actually feel them through this story about your great grandmother. Thank you so much! I didn’t make the connection between Jan’s post and postcards, though I should have. I have an extensive collection of family postcards. Most were sent between my paternal grandparents during their engagement, 1910-1911. As both of them took and developed their own photographs, a fair number include those. At one point, my father put them in chronological order; they fill a shoebox. I haven’t gone through them, sad to say. There are more in albums between other family members. I know what a fount of information they hold, even as brief and public as they are. I also have a single letter he sent her in 1907, a long, articulate love letter. There must have been many others that are lost to us. I treasure that one for what it tells me about their relationship when he didn’t have to consider what her protective parents and five curious younger siblings would think if they saw it!